Vampires, werewolves, witches, demons of nonspecific origin. All of them are drawn to the Hellmouth in Sunnydale, California. And all of them have met their fate at the hands - or stake - of Buffy the Vampire Slayer. Since its premiere, the popular TV show has pitted the Chosen One against the forces of darkness on a weekly basis. And her success is due in part to the intense research her Watcher, Rupert Giles, and the rest of the gang have done to find the origin and best method of disposal for each villain. 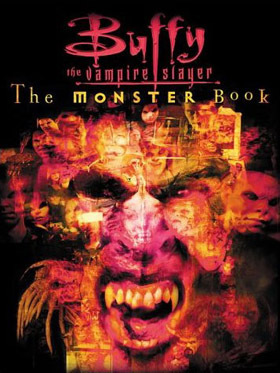 THE MONSTER BOOK expands upon information revealed through Giles' research and knowledge, exploring the mythological, literary, and cultural origins of the endless numbers of ghoulish creatures that have tried to take a piece of the Slayer. Before the Master, there was Dracula, before "Becoming," there was Nosferatu. Before Buffy, there was...no one. The true horror fan knows that the legend of the vampire has existed for as long as there have been legends, But the demons that greet the business end of Buffy's stake are one part tradition, three parts creative genius. Indeed, the Buffy creators have purposefully moved away from recent vampire fictions to find a middle ground among ancient lore, Bram Stoker's "rules," and their own twist on the topic. Note that this is not just a guide to the monsters on the show, featuring interviews with all the primary writers on the series—though it IS that! It’s also an exhaustive, meticulously researched history of monsters in folklore and popular culture. Here you'll find exclusive interviews with series creator Joss Whedon and the Emmy-nominate team that creates the images you can't shake. THE MONSTER BOOK welcomes you to the Hellmouth.